Finally, after almost 20 years of wandering, Theatre in the Rough comes home to the New McPhetres Hall at 4th and Gold, Downtown. Juneau Community Foundation. 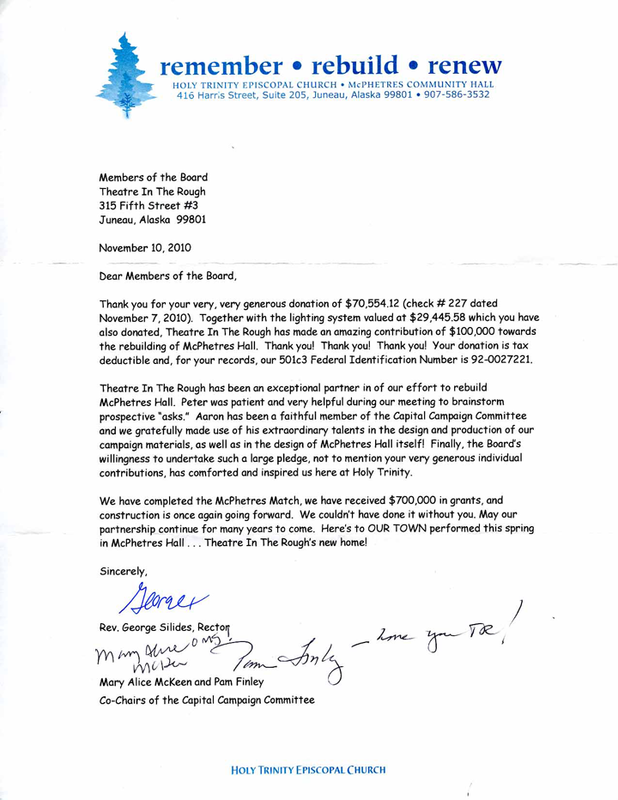 Theatre in the Rough has pledged to donate $150,000 to finish and furnish the New McPhetres Hall at Holy Trinity Episcopal Church. In November 2010, on the closing night of Cyrano de bergerac, the TR board of directors presented Holy Trinity with a brand new lighting system and a check, together totaling $100,000. the instruction, "Make it beautiful." This is an enormous accomplishement, Juneau. You should be very proud of your town, we certainly are. If you want to contribue to the final push, you can use the links above to make a donation or pledge a chair. Thank you! sign up for our quarterly newsletter, The Roughian or contact us.